In the decision, the 2nd U.S. Circuit Court of Appeals in New York admitted that some of the actions made by Bromwich "give pause." But that wasn't enough to have him entirely removed from his oversight position, as noted by Reuters. Bromwich was assigned to keep tabs Apple's operations following an antitrust lawsuit won against the company by the U.S. government. And while Apple and Bromwich have not seen eye to eye from the start, in recent months the relationship has worsened. In a statement made to Judge Denise Cote last month, Bromwich said Apple has taken a more "adversarial tone" in recent discussions. In addition, he said that no interviews have been conducted since January, since Apple has rejected his requests. Apple has taken issue with the extent of the investigations by Bromwich, alleging that his reviews have gone beyond the original intent by the court. Some outside of the company have agreed, including a circuit court judge and the editorial board of The Wall Street Journal. In its decision on Wednesday, the 2nd U.S. Circuit Court of Appeals apparently agreed with some of those criticisms of Bromwich, but did not feel there was enough to have a new antitrust compliance monitor appointed. As a result, Bromwich's oversight of Apple will remain. In February, the Journal's opinion page slammed Bromwich's approach as being "major abuse, even by the standards of modern antitrust." The newspaper even alleged that Apple should sue Bromwich for his investigation, which has cost the company more than $2.65 million and has involved investigations into Apple's Siri, Maps and hardware engineering groups, none of which are related to the e-book antitrust lawsuit. The U.S. government's ruling saddled Apple with an injunction that bars it from entering into any unsavory deals with publishers, and as antitrust monitor, Bromwich's job is to ensure that Apple follows those restrictions. Apple officials have said they continue to fight the case out of principle, because the company insists that no illegal collusion took place between itself and book publishers. For the launch of the iBookstore, Apple and book publishers opted to switch to a so-called "agency" pricing model, that allowed publishers to control the prices of books and prevented resellers like Amazon from undercutting those rates. 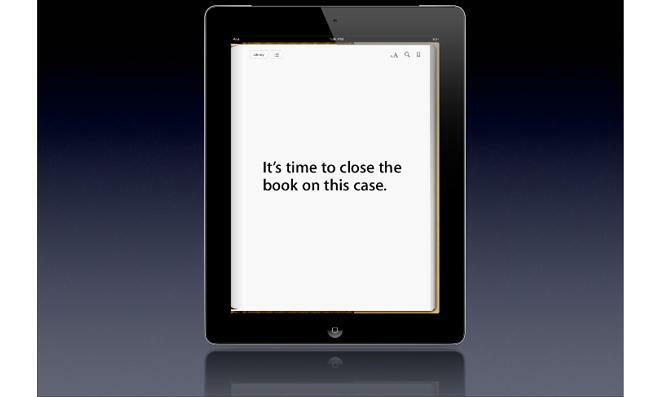 The subsequent increase in e-book prices led the government to take action. Since then, the agency has switched back to the "wholesale model" preferred by Amazon, which allows resellers to set prices, and sell titles at or below costs if they so choose.